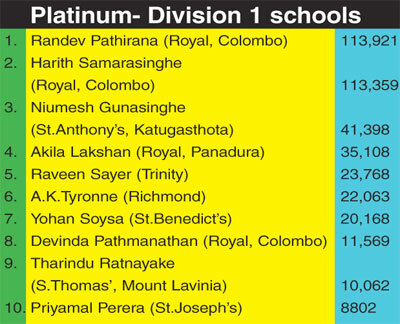 The two Royalists _ Randev Pathirana (113,921) and Harith Samarasinghe (113,359) are engaged in a compelling battle for supremacy with Pathirana still in the lead with a majority of 562 votes in the ‘Platinum ‘ contest for division 1 schools at the end of the penultimate count in the Sunday Observer/Mobitel Most Popular Schoolboy Cricketer Of The Year Contest at the end of count number 19. The final coupon will appear this week in the Sunday Observer, Daily News and Dinamina and the closing date for the coupons will be on June 13 , at 12 noon. A close contest is also on in the other two segments, Gold and Silver as well and voters are kindly requested to send in their coupons early. 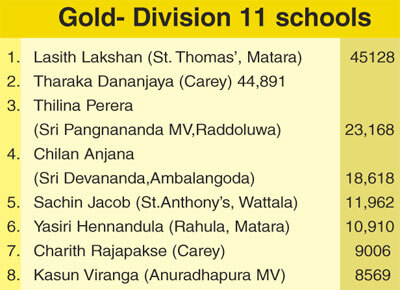 In the ‘Gold’ Contest, Lasith Lakshan of St.Thomas’, Matara (45,128) has a close 237 vote lead over Carey’s Tharaka Dananjaya (44,891). 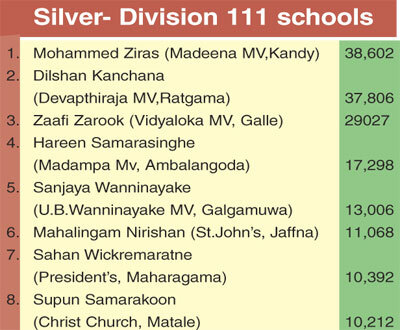 In the ‘Silver’ segment, Mohammed Ziras (38,602) of Madeena MV, Kandy has received a lot of support from his fans as he has a majority of 796 votes over his closest rival Dilshan Kanchana (37806) of Devapathiraja MV, Ratgama.